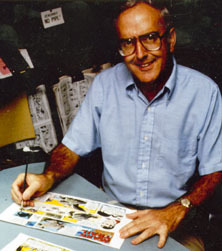 Cartoonist Jack Elrod at work. A cartoonist is an artist who draws cartoons, animated cartoons (see animation/anime), and/or comics/manga. A manga artist is also known as a mangaka. Traditionally, cartoonists work in "cartoony" drawing style, first sketching the drawing roughly in pencil, then going over the sketches in black ink, using either brushes or metal nibbed pens, and finally erasing the pencil lines. In professional comic production, artists often specialize in one of the two main steps. The pencillers do the 1st phase in pencil, while the inkers do the 2nd phase in ink. Today, cartoonists often work in part or completely in digital on a computer. The digital computer graphics approach is particularly useful for colorizing a cartoon, comic or animation. Contemporary artists who create spanking cartoons, spanking comics, spanking manga or spanking anime include Comixpank, JPC, Drooaygah, Erika Kyoukousha, Franco, Jay Em, Kitora66, Makoto, Milo Manara, Oscar, rsj1, Spankart, and Ron Wilson. This page was last edited on 25 March 2016, at 16:44.